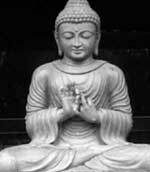 Buddhism is a moral philosophy / religion based upon the teachings of Siddhartha Gautama (566 - 486 B.C.). 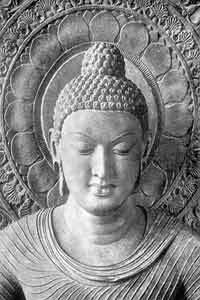 Siddhartha Gautama became known as the Buddha. 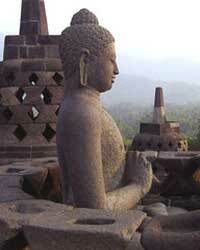 'Buddha' (from the ancient Indian languages of Pali and Sanskrit) means "one who has awakened". It is derived from the verbal root "budh", meaning "to awaken" or "to be enlightened", and "to comprehend". The Buddha offered metaphysical knowledge into the nature of reality as well as a moral way of life. The Middle Way is an important idea in Buddhist thought and practice. To seek moderation and avoid the extremes of self-indulgence and self-mortification. Maggo: There is a path that leads out of suffering, known as the Noble Eightfold Path (right view, right thought, right speech, right conduct, right vocation, right effort, right attention and right concentration). Not to do any evil, to cultivate the good, to purify one’s mind, this is the Teaching of the Buddhas. To speak no ill will, to do no harm, to practice self-restraint according to the fundamental precepts, to be moderate in eating, to live in seclusion, to devote oneself to higher consciousness, this is the Teaching of the Buddhas. By endeavour, diligence, discipline and self-mastery, let the wise person make (of himself) an island that no flood can overwhelm. All (mental) states have mind as their forerunner, mind is their chief, and they are mind-made. If one speaks or acts with a defiled mind, then suffering follows ..
Hard to restrain, unstable is this mind; it flits wherever it lists. Good is it to control the mind. A controlled mind brings happiness. 'All conditioned things are impermanent’, when one sees this in wisdom, then one becomes dispassionate towards the painful. This is the Path to Purity. See our webpage Buddha Nirvana / Buddhism Religion for more pictures, information and quotes on Karma, Truth, the Dynamic Unity of Reality, Buddha's conception of Mind and Matter, The Four Noble Truths and the Eightfold Path, Anatta (No Soul) and Conditioned Genesis (Paticca-samuppada). The first collection of Indian philosophy that was written down was the Vedas. The word 'Veda' comes from the Sanskrit vid, meaning knowledge - the Vedas are 'sacred knowledge'. Their exact date is controversial, it is possible that the knowledge dates back 10,000 years BC, and were first written around 3,000 BC. The metaphysical foundation of Hinduism, which is expressed in both the Vedas and the Upanishads is that Reality (Brahman) is One or Absolute, changeless, perfect and eternal. The ordinary human world of many separate and discrete (finite) things (which our mind represents by our senses) is an illusion. Through meditation and purity of mind, one can experience their true Self which is Brahman, God, the One infinite eternal thing which causes and connects the many things. True enlightenment is Self-realisation, to experience the supreme reality as Self.
" 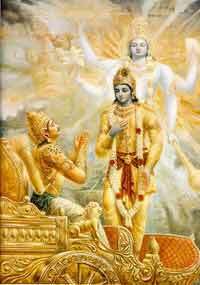 OM Lead me from falsehood to truth, from darkness to light, from death to immortality." Though One, Brahman is the cause of the many. In Indian philosophy, the main terms used by Hindus and Buddhists have dynamic connotations. 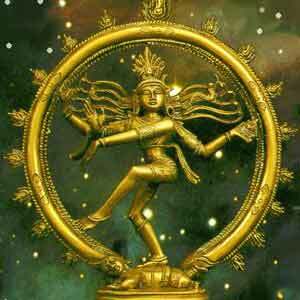 The word Brahman is derived from the Sanskrit root brih - to grow- and thus suggests a reality which is dynamic and alive. The Upanishads refer to Brahman as 'this unformed, immortal, moving', thus associating it with motion even though it transcends all forms.' The Rig Veda uses another term to express the dynamic character of the universe, the term Rita. This word comes from the root ri- to move. In its phenomenal aspect, the cosmic One is thus intrinsically dynamic, and the apprehension of its dynamic nature is basic to all schools of Eastern mysticism. Taoism is one of the great religions / philosophies of Ancient China (along with Buddhism and Confucianism). In 440 B.C. Taoism was adopted as a state religion of China, with Lao Tzu (so called founder of Taoism) honoured as a deity. Lao Tzu was a contemporary of Confucius and wrote a book called the Tao te Ching, composed some time between the sixth and third centuries B.C. Some people believe Lao Tzu is a mythical character. State support of Taoism ended in 1911 with the end of the Ch'ing Dynasty and much Taoist heritage was destroyed. Tao (pronounced 'Dao') can be defined as 'path', or 'road'. The way of the Tao is the way of Nature and of ultimate reality. Tao is often described as a force that flows through all life. A happy and virtuous life is one that is in harmony with the Tao, with Nature. 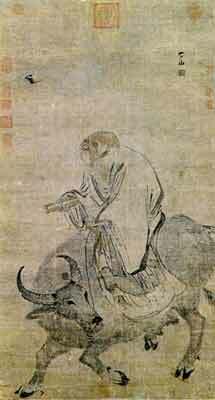 The philosophy of Taoism understands Tao as the One Thing which exists and connects the Many things. Tao, Nature, Reality are One. “There is a thing, formless yet complete. Before heaven and earth it existed. it stands alone and unchanging. It is all-pervading and unfailing. One may think of it as the mother of all beneath Heaven. We do not know its name, but we call it Tao. All things depend on it for life, and it does not turn away from them. It accomplishes its tasks, but does not claim credit for it. It clothes and feeds all things, but does not claim to be master over them. “Being one with Nature, he is in accord with the Tao. 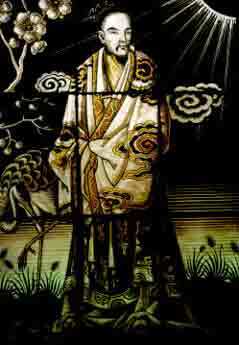 See our webpage Taoism / Philosophy of the Tao for more quotes, information, history and pictures. Confucianism is an ethical and philosophical system based upon the teachings of the Chinese sage, Confucius. Confucius was a famous thinker and social philosopher of China, whose teachings have deeply influenced East Asia for centuries. Living in the Spring and Autumn period (a time when feudal states fought against each other), he was convinced of his ability to restore the world's order, though failed. After much travelling around China to promote his ideas among rulers, he eventually became involved in teaching disciples. His philosophy emphasized personal and governmental morality, correctness of social relationships, and justice and sincerity. 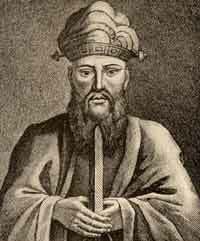 Used since then as the imperial orthodoxy, Confucius' thoughts have been developed into a vast and complete philosophical system known in the west as Confucianism. 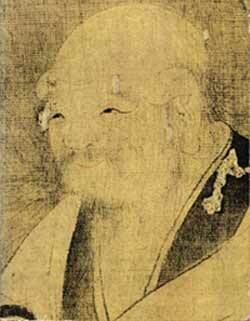 The Analects is a short collection of his discussions with disciples, compiled posthumously. These contain an overview of his teachings. Confucius presents himself as a transmitter who invented nothing and his greatest emphasis may be on study, the Chinese character that opens the book. In this respect, he is seen by Chinese people as the Greatest Master. Far from trying to build a systematic theory of life and society, he wanted his disciples to think deeply for themselves and relentlessly study the outside world. For almost two thousand years, Analects had also been the fundamental course of study for any Chinese scholar, for a man was not considered morally upright or enlightened if he did not study Confucius' works. See our webpage Confucius / Confucianism for more pictures, quotes and information.